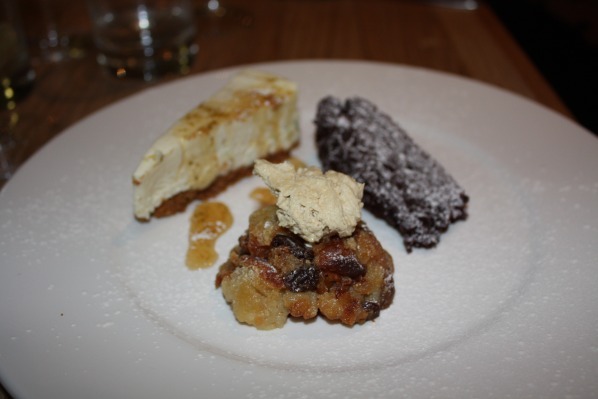 This week, I was lucky enough to be invited to a press tasting evening at Creole Brasserie, the restaurant now sitting on the site of the old 3 Coqs Brasserie on Whiteladies Road. With illustrious company including bloggers Rocket And Parmesan, Eat Nurse Cook and Gert Lush and local celebrity Cherrie Eugene, it was certainly an entertaining evening! The restaurant has seen a few changes, decor-wise, since the old 3 Coqs days. Entrance to the restaurant remains via a steep staircase (be careful of the Creole Punch, the stairs would be lethal after a few glasses! ), but the interior has been transformed. 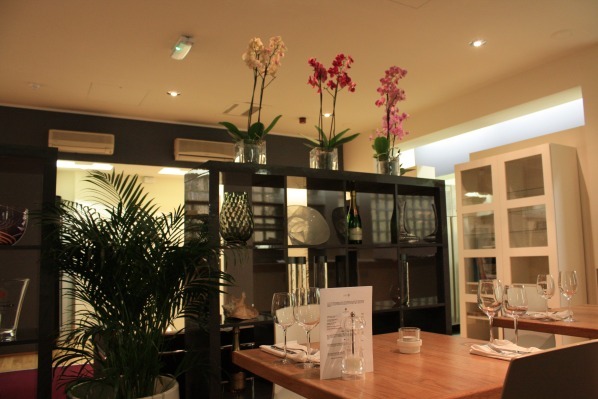 A comfortable seating area takes up one side of the restaurant, ideal for those who are waiting for a table or simply want to head over and enjoy a drink – divided from the main restaurant area by shelves stocked with champagne bottles and various decorative items. The kitchen remains open plan, and floor to ceiling windows lead to a view across Whiteladies Road and its junction with Cotham Hill. It’s a first restaurant venture for owners Abie-Gail Pixley and Frederic Arbaud, who are both new to Bristol. Abie’s Jamaican roots and catering background, combined with Frederic’s Gallic charm front-of-house, are a promising basis on which to manage this historically difficult location. After a welcome jug of Creole Punch for the table – a warming blend of Wray & Nephew rum, sugar syrup, tropical fruits and lime – it was time to work our way through tasters of most of the menu. 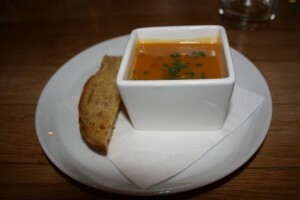 Our evening began with a small bowl of spicy sweet potato soup, served with homemade pepper bread (£6.95 for a full portion). We were all blown away by the soup. Frederic had already told us of the pair’s love of spices, and this was perfectly seasoned. Although it had a hefty chilli kick, the sweetness of the sweet potato was still evident, and the bread was fantastic. 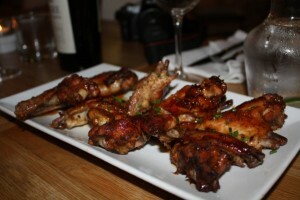 Platters of sticky citrus chilli wings (£7.95 for a full portion) were also very well received, the sticky marinade of grapefruit, lemon, lime and sugar countered by another hit of chilli. Delicious. A starter platter of samples of three further menu items was probably my least favourite of the evening. 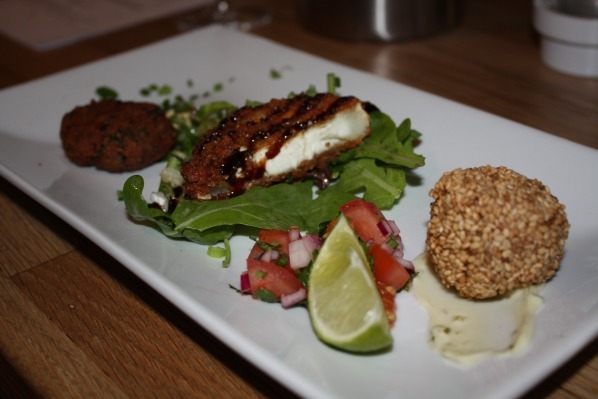 The deep fried goats cheese (normally served as a salad at £7.95) was perfectly tasty and Cajun-spiced, but seemed at odds with the rest of the menu. I wasn’t entirely convinced by the texture of the Bene crusted shrimp balls (normally £7.95), and it was a little hard to determine the flavour of the shrimp. The black eyed pea fritters, however (served with side dishes as a vegetarian main for £10.95) were beautiful. Wonderfully spiced pastries – puff and beef, filo and lamb – filled the gap between the starter and the main, another trio of tasters from the main menu. 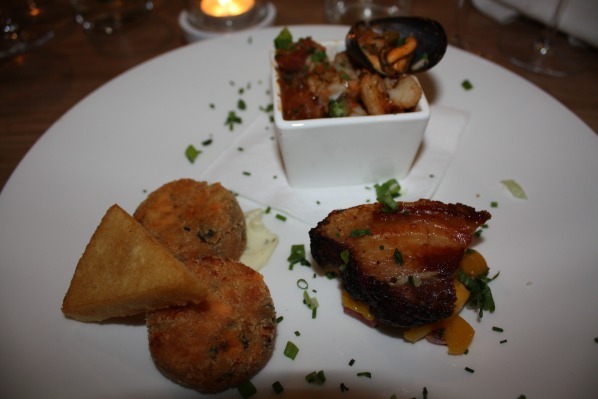 While not overly enamoured with the baked seafood cakes (normal dish £11.95) as they were a little dry, the other two samples were fantastic. Initially dubious about the decision to serve roast belly of pork with a mango salsa (full portion £13.95), the combination proved to be fantastic. The meat was perfectly tender with a crisp and salty crackling – too salty, it must be said, for some, but great, in my opinion, with the sweetness of the fruit. I’ll definitely be ordering the jambalaya (normally £14.95) on my next visit: a combination of chicken, smoked sausage, prawns, mussels and rice in a rich, wonderfully spiced stock. Side orders are charged separately, at £2.95 each. 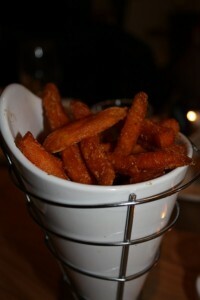 It would be foolish, if you visit, not to try the sweet potato fries, which were universally loved on the night. It was a struggle to eat the three dessert tasters after so much food! The drunken brioche and butter pudding (£5.95) is a great wintry dessert, but the rum-soaked fruits could have done with a little more booze. Flavour-wise, the baked key lime cheesecake (also £5.95) was my highlight, but some diners felt that the consistency was a little too soft. An incredibly decadent chocolate truffle torte (£6.95), made with 70% pure chocolate, completed the line up and the empty plates around the table proved that there’s always room for a good dessert! A promising start for Bristol’s first Creole restaurant. The passion for food and flavour from both Abie and Frederic is evident – and while there were a few niggles, we all very much enjoyed our evening. If you’re looking for something a little different, then it’s well worth giving Creole Brasserie a go.